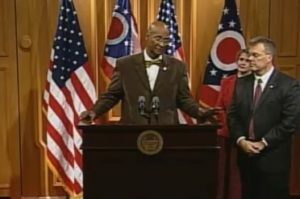 COLUMBUS, OH — Two Ohio lawmakers introduced a state version of the Religious Freedom Restoration Act (RFRA) this week, complementing the federal law that is already the standard across the nation. Representatives Tim Derickson (R) and Bill Patmon (D) held a press conference on Wednesday in the state capital to outline the purpose of the bill, and also issued a news release the same day. The bi-partisan bill seeks to ensure that practices such as wearing a cross to work, posting Christian artwork or hosting student-led prayer at school events, and other public displays of faith, are protected. During the news conference, Patmon spoke of his belief that government came from God, and it is therefore government’s duty to protect the freedoms bestowed on the nation by God. Therefore, the men seek to protect religious freedom in the state from activist judges by ensuring that the “strict scrutiny” standard is applied in all lawsuits that challenge religious practices. The standard, commonly used in courts across the country, requires that the regulation have a “compelling government interest” in order to pass constitutional scrutiny. The men state that because they have observed religious freedoms being eroded in the courts in other states, they wish to ensure proper protection in Ohio. Currently, 17 states have similar religious freedom statutes on the books. The federal Religious Freedom Restoration Act was signed into law in 1993 by then-President Bill Clinton, but only applies to federal laws. The U.S. Supreme Court has urged states to enact their own RFRA law to protect citizens. The Ohio proposal is approved by Family Research Council, the Liberty Foundation, Citizens for Community Values, Citizen Link and other national and local religious groups.